Joshua Lund has never been tempted to specialize in one form of media. In fact, he finds studying a combination of literature, visual culture, and art to be the richest way to think about social problems in Latin America. Lund, who joins Notre Dame’s Department of Romance and Romance Languages as an associate professor of Spanish, has research interests that are both broad and intentionally interdisciplinary. Trained as a scholar of literature, Lund also brings expertise in Latin American film, political history, and cultural politics. 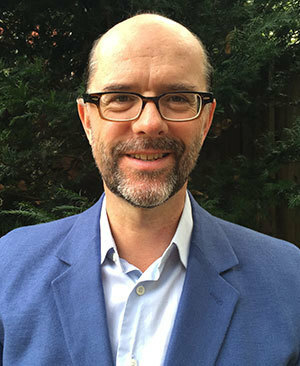 “Professor Lund is a leading scholar in the fields of Mexican and Latin American studies, and he has established a reputation as a top-notch literary and cultural critic,” said Thomas Anderson, chair of the department and a professor of Spanish. Lund’s passion for Latin America dates back more than two decades to his time, ironically, in Paris. During his yearlong study abroad there, he spent entire days consuming literature, namely the writings of famed Colombian novelist Gabriel García Márquez and Argentinian writer Jorge Luis Borges. He soon realized that to truly study such work, he needed to master Spanish. After college, Lund traveled to Mexico, Spain, and Chile. Returning home essentially fluent in the language, he landed a job serving the Spanish-speaking population at St. Stephen’s Shelter, a program dedicated to ending homelessness in Minneapolis. “That guided me back to studying literature and culture with a political and social edge to it,” Lund said. Currently, Lund is focused on a collaborative project, Men with Guns: Cultures of Paramilitarism in the Modern Americas, with co-director Anne Garland Mahler, an assistant professor of Spanish and Portuguese at the University of Arizona. Alongside more than a dozen collaborators from wide-ranging disciplines—including sociology, political science, anthropology, law, literature, film, and history—Lund is examining “the history and overwhelming cultural strength of forms of paramilitarism in the modern Americas.” A symposium scheduled for November in Tucson, Arizona, will serve as the launch of a collaborative book project on the topic. As part of that research, Lund will write a short book on German filmmaker Werner Herzog, the first in a multi-volume series on transnational film. The director of Grizzly Man, Fitzcarraldo, and Aguirre, the Wrath of God, Herzog has produced multiple films in Latin America—a happy coincidence for Lund, who is a fan of his work. As eager as he is to be analyzing the formidable filmmaker, Lund is still more enthusiastic about his role as a teacher. In the fall semester, he is offering a survey course on Mexican film. Soon, Lund will be teaching a wider variety of courses and working with graduate students on their dissertations.